REAL ID | Papers, Please! | Page 2 REAL ID – Page 2 – Papers, Please! Is your drivers license or state ID in the national REAL-ID database? One of the major goals of the REAL-ID Act of 2005 was to create, and to pressure state governments to participate in, a national database of drivers’ licenses and state-issued ID cards. Despite its name, which might be taken as implying that it is merely a messaging system, S2S relies on a centralized national database, “SPEXS”, which contains a record for each drivers’ license or ID card issued by any participating state or territory. The DHS has been certifying states and territories as “compliant” with the REAL-ID Act, without regard for whether they have complied with this provision of the Federal law. But that begs the question of how many states have uploaded information about how many of their residents to the national database in order to comply with the REAL-ID Act. Are records of drivers’ licenses and ID cards issued by your state or territory already included in the national database? If not, when will they be? 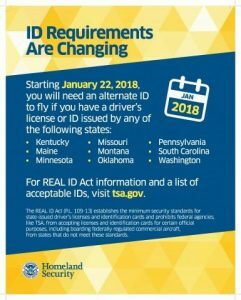 In the latest installment of the game of chicken between the Department of Homeland Security and US states and territories over the REAL-ID Act of 2005, the DHS has announced that drivers licenses and IDS issued by American Samoa won’t be accepted at TSA checkpoints for “domestic” flights beginning next Monday, February 5, 2018 — unless the DHS, in its standardless discretion, backs down again as it has so many times before, and gives American Samoan travelers a last-minute reprieve. Why American Samoa? And what will this actually mean? We’ve been spending a lot of our time lately writing letters to the editor pointing out errors and requesting corrections of news stories reporting DHS propaganda as fact. Earlier this month, the DHS postponed from January 22, 2018, to October 10, 2018, the date on which it had threatened to have the TSA begin (illegally) interfering with air travel by residents of certain states. Since neither the January 22, 2018, date nor the choice of which states to threaten was set by law or regulation, but solely by DHS press release, the DHS could and did withdraw its threat merely by issuing another press release. The DHS had little choice, after its bluff was called by reality (compliance with the REAL-ID Act would require more money, more time, and changes to state laws and in some states incluidng California, changes to state constitutions) and the likelihood of resistance by the flying public (any attempt to prevent residents of certain states from flying without ID would lead to protests at airports and lawsuits that the TSA and DHS would likely lose). But we are not surprised, given the long history of DHS lies about the REAL-ID Act and ID to fly, that the DHS press release withdrawing the threat of a January 22, 2018, crackdown on air travel without ID by residents of certain states was immediately followed by a renewed DHS public relations campaign of lies about the law and the facts. DHS press releases should no more be published as “facts” without fact-checking or acknowledgment that they contain contested (and readily refuted) factual and legal claims than should President Trump’s, President Obama’s, or anyone else’s Tweets. The New York Times is the latest news outlet to have been taken in, yet again, by this DHS “fake news” campaign, with an article this week on the Times’ website and in the travel section, “Is Your ID Approved for Travel? These Are the Latest Rules“. Many of the DHS falsehoods in this article were reported as facts in an earlier story in the Times in November, 2017, by the same reporter, Shivani Vora. We wrote to Ms. Vora at that time to correct the errors in that story, but received no reply. To be clear, DHS claims are worthy of reporting as news. It is newsworthy that the DHS has engaged in a decade-long campaign, through both Democratic and Republican Administrations, of brazen public lies about the REAL-ID Act and ID to fly. It is equally newsworthy, however, that a “newspaper of record” appears to have made no attempt to fact-check the claims made by DHS spokespeople or to include any other points of view, and repeats demonstrably false DHS claims as undisputed facts even after their falsehood was pointed out to the reporter on the story. 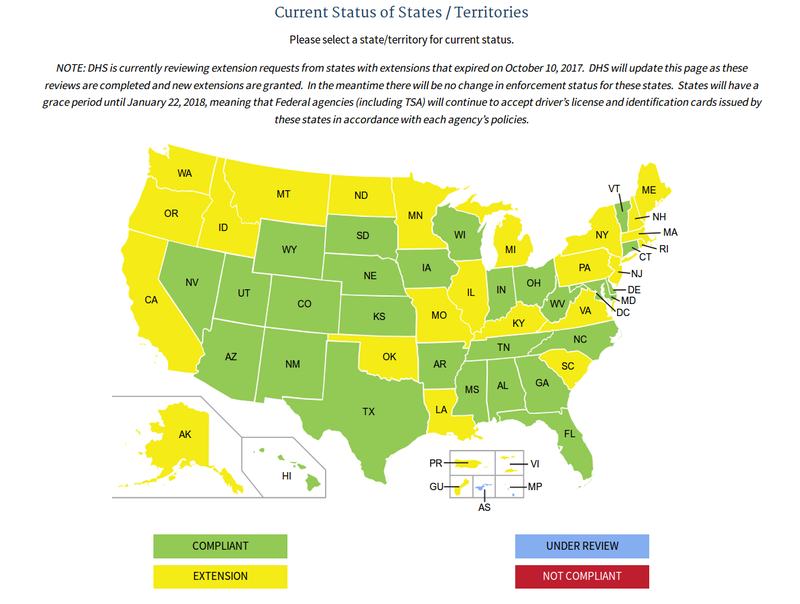 Again postponing its threats to interfere with air travel by residents of “noncompliant” states, the Department of Homeland Security announced today that it has given the last three remaining states either certifications of “compliance” with the REAL-ID Act of 2005, or extensions of time to comply until at least October 10, 2018. Travelers in all 50 states can continue to ignore the false signs at airports, the false claims being made by state authorities collaborating with the Feds in the national ID scheme, and the blizzard of confused and error-filled news stories (largely based on unverified and misleading DHS and state government press releases) claiming that U.S. citizens will need to obtain, carry, or show passports or other government-issued ID in order to travel by air. This does not mean that all or most states have actually complied with the REAL-ID Act or are planning to do so. 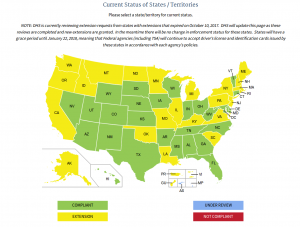 At most 14 states are arguably compliant with the Federal law. 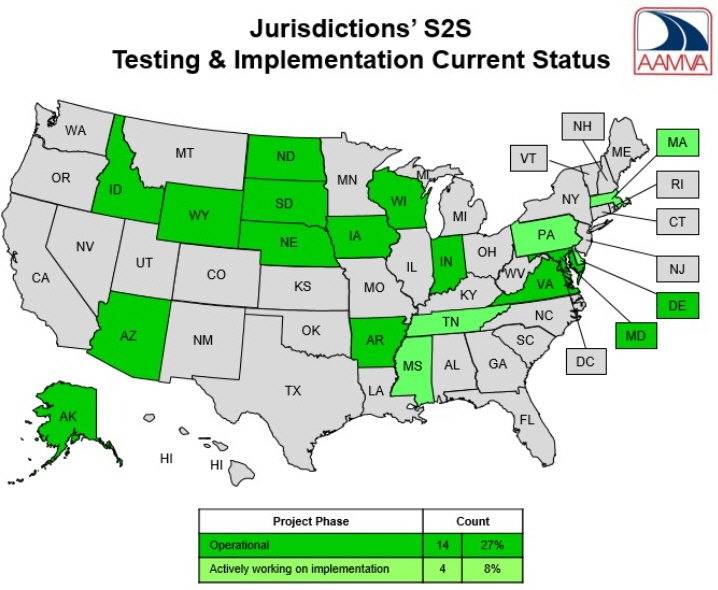 In addition to the 14 current SPEXS particpants, the contractor managing the national ID database optimistically lists 4 other states as “actively working on implementation.” But none of these states are listed as having signed letters of intent to join the SPEXS national ID database. 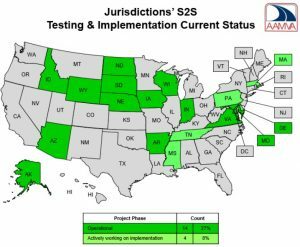 The other 32 states are not compliant with the data-sharing provision of the REAL-ID Act, and have given no indication of intent to comply. On the Friday before Christmas Monday, when state officials hoped that everyone who might object would be sleeping, the California Department of Motor Vehicles finalized its regulations for partial compliance by the state with the Federal REAL-ID Act of 2005. The final regulations and a statement of responses to public testimony and comments were posted on the DMV website on December 22, 2017, and went into effect the same day. The final regulations are essentially unchanged from those the DMV proposed in September 2017, and that we objected to in written comments and in-person testimony at the DMV’s one hearing on the proposal in Sacramento in October. The DMV’s response to public testimony and comments brushes off our objections, and the objections by other commenters and witnesses, on the basis of repeated invocation of patently false and/or irrelevant and unresponsive legal and factual claims. The Department of Homeland Security and the Transportation Security Administration have threatened to prevent citizens of many US states from being able to travel by air within the US, starting in January 2018, because their state governments won’t dump all their driver’s license and ID card information into a nationwide database. But these threats didn’t actually cause states to follow the TSA’s illegal orders. So rather than follow through on the threat, which would risk a legal challenge that would make it clear the threat is hollow, the DHS has again blinked. It just quietly deferred its deadline about when it claims it will enforce the REAL-ID Act against airline passengers. Just over a week ago, when we testified before the California Department of Motor Vehicles about why the largest state in the union should not comply with the REAL-ID Act, and could not do so without violating its state constitution and its residents’ rights, the DHS website included California among 21 states “under review” by the DHS for possible Federal interference with their residents’ right to travel by air beginning as early as January 18, 2018. Just days later, the DHS in its standardless discretion granted 15 of these 21 states, including California, another round of “extensions of time” to comply with the REAL-ID Act until October 20, 2018. The dates picked by the DHS are as arbitrary as the DHS choices of which states to threaten. The DHS has repeatedly amended its REAL-ID Act regulations to postpone its threatened “deadlines”, but neither January 18, 2018, nor October 20, 2018, are dates that appear anywhere in the law or the most recently revised regulations. 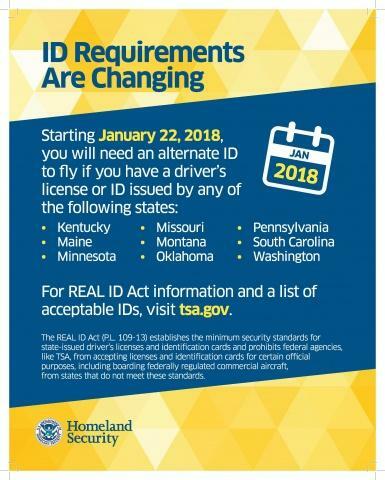 Statements about current and future ID “requirements” similar to those on these websites have also appeared on official signs in some airports. It should go without saying that neither government websites nor informational signs in airports create legal rights or obligations or can be relied on as authoritative statements of the law. Federal law is contained in the US Constitution, international treaties duly ratified by the US in accordance with the US Constitution, the US Code, and US Public Laws. Federal regulations are contained in the Code of Federal Regulations. The Freedom of Information Act requires that binding Federal agency rules, regulations, and orders of general applicability be published in the Federal Register. If you want to know what the law says, you need to read the law, not press releases from government agencies or anyone else (including us!). This is especially important with respect to the TSA, since the TSA website and TSA signs in airports have for years included statements about ID requirements to fly that have been disclaimed by TSA witnesses testifying under oath and by TSA lawyers arguing before Federal courts. So what is the TSA saying now about ID to fly? Is it true? And is it legal? The TSA’s latest public statements are more accurate than some of the agency’s previous press releases about ID to fly, and may (although we can’t really tell, given the absence of fomal proposals or published rules) accurately describe the changes the TSA intends to implement. But major questions remain about the legality of both current and possible future ID practices at TSA and contractor checkpoints at US airports.